Description: PRESIOUS (Predictive Digitization, Restoration and Degradation Assessment of Cultural Heritage Objects) is a EU STREP project (FP7) from Grant No. 600533. 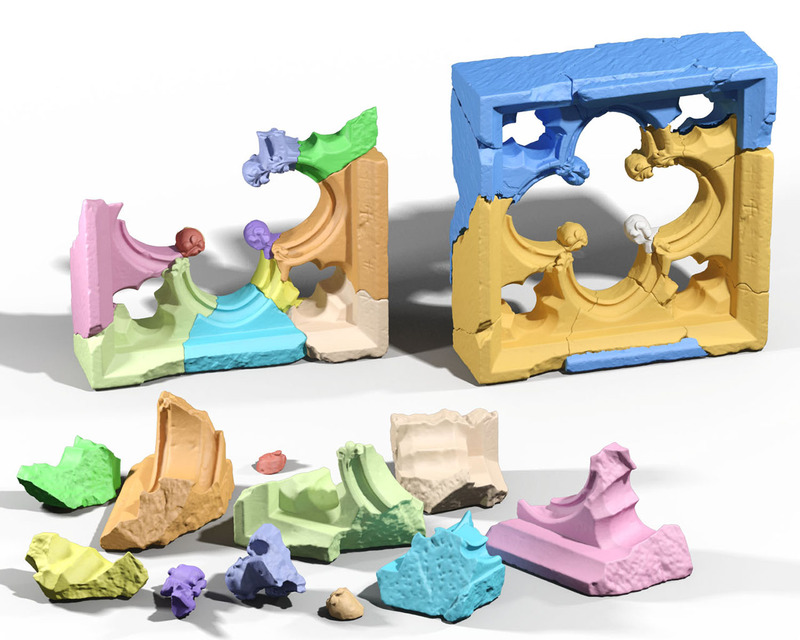 Using a common core of geometric processing, analysis and retrieval methods, PRESIOUS aims to investigate innovative ICT solutions to the following key identified challenges: a) the difficulty and inefficiency of the 3D digitisation process, b) the quantification of stone monument degradation, and c) the reconstruction of objects from large numbers of constituent fragments that may be worn, immovable, dispersed or incomplete. Description: GLIDE (Goal-driven Lighting for Dynamic 3D Environments) is a EU/NSRF - ARISTEIA II from Grant No. 3712 that focuses on interactive inverse lighting and opening problems for industrial applications, targeting light emission and positioning, automatic placement of openings and interactive photorealistic rendering.